Institute for Regional Forecasting Director Bill Gilmer gave his economic forecast for 2018 during the Spring 2018 Symposium. See more photos. 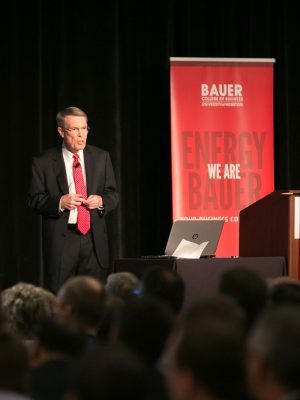 Economist Robert W. “Bill” Gilmer shared insights on the state of the Houston economy last week during the C. T. Bauer College of Business Institute for Regional Forecasting Spring Economic Symposium. With Hurricane Harvey’s biggest impacts left behind and a significant turnaround in oil and gas underway, “it’s time to reset the clock on Houston’s growth,” Gilmer said. Gilmer called attention to some of the positive factors that reflect a growth cycle: revised estimates of 2017 job growth to 62,900 and the return of payroll employment growth for the first time since 2014; a projected addition of 45,000 to 55,000 jobs in 2018; crude production and exports hitting record highs; expanding international oil markets. Increases in oil production has been incremental, and political risk related to potential supply disruptions have driven oil prices upward to an average of $60 to $65 per barrel, he said. “Discipline is the watchword,” Gilmer added, noting that low barriers to entry have made fracking an attractive investment, which could ultimately backfire if too many producers come online. Gilmer said it is remarkable the area did not experience a recession in the past few years “despite one of the worst oil collapses in American history,” with 75,000 jobs in that sector lost. Petrochemical plant construction and Hurricane Harvey recovery spending — both are now winding down — were part of the support system, he said. Houston’s real estate market saw a significant drop in home listings post-Harvey, but the storm’s net effect on sales is negligible, Gilmer said. The outlook for Houston’s office market remains bleak, but the vacancy rate has probably peaked (21 percent for the best properties) and will likely fall to 12 or 13 percent over the next three to four years as more oil jobs are added back, Gilmer said. Gilmer will share his next set of projections at the Bauer Institute for Regional Forecasting’s Fall Symposium Nov. 6. For more information on the IRF and Gilmer’s presentation, click here.